The tragic events of the First World War effectively brought to on end many of the radical artistic experimes generated by Cubism. Picasso remained a non-combatant throughout the war, protected from conscription by his Spanish citizenship However, avant-garde practices, including Cubism, initially fell out of favour, not least of all as many of those who had supported Cubism, such as Picasso's German art dealer Daniel-Henry Kahnweiler, had been forced into exile. In this climate Picasso's art inevitably changed. One of the catalysts for this change was the writer Jean Cocteau (1889-63), who recruited Picasso into a theatrical venture he was planning. 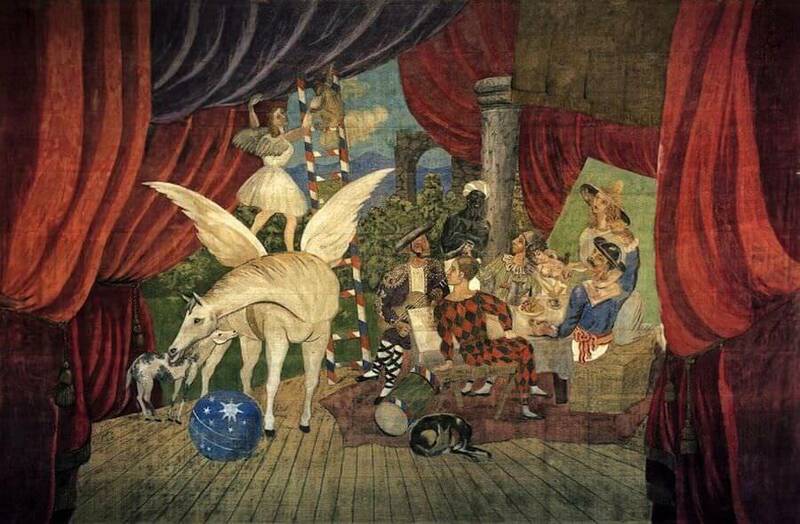 Through Cocteau, Picasso was introduced to the Russian theatrical troupe, the Ballets Russes, starting a collaboration that was highly fruitful for years to come, Picasso's entree into this milieu came with his curtain design for the production of Parade, an avant-garde theatrical extravaganza that opened in Paris in May 1917, Although Parade proved to be a highly controversial production, Picasso's design reflected his move back towards the more romantic representation of street performers that had characterized his earlier work.